Kumho V720 - Miata Turbo Forum - Boost cars, acquire cats. 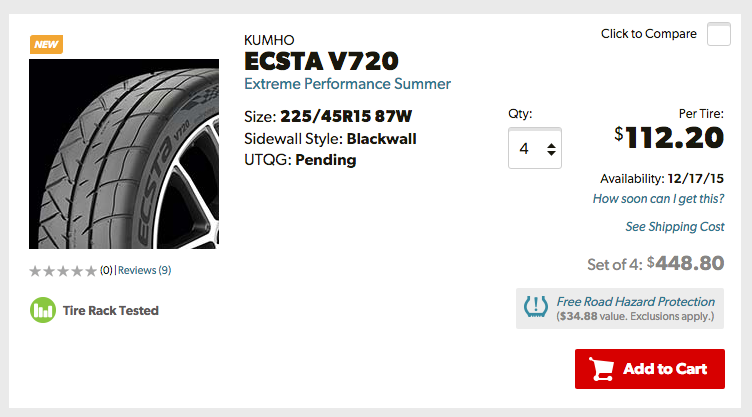 I was just browsing tires on tirerack and stumbled onto this new Kumho V720. It looks like it's the replacing the XS, which has done well to meet my needs. Has anyone run these tires yet? Impressions? Particularly compared to the XS? I was planning to move to a 225 RS3, but a sub $100 205 might be tough to pass up. The autox community seems to like them a lot better than the XS. For the price, give them a shot. General consensus is that they MIGHT not be as good as the RE71R, but they're certainly cheaper. I'd run them if they came in 225/45. it would be nice to see some reviews, the XS were supposed to be horrible in the wet. I just received a set in 215/45-17 for my wife's NC. We're taking it to FM's summer camp and doing track time, and I didn't think the current tires would make the trip there and back with the track abuse. As noted, these were definitely cheap enough. I expect we'll get some rain on the trip, so I should be able to give an all 'round review on them... in early August. Won't even be mounting them 'till mid-July. the XS are horrible in the wet. Looking forward to the review Roda. I didn't mind the XS in the wet, but am very interested to see how the V720 performs. I doubt it'll be RE71R/Rival-S level, but we'll see. I think the V720 is positioned more as a track day / chumpcar tire than autocross, assuming it's "harder" and more heat tolerant like the XS. Caviat: this is the first set of 200TW tires our NC has had, so I can't directly compare it to anything but what I've run on my NA, and this is all going to be subjective as I won't have lap times to compare to. Got these mounted up last week, and finally got a chance to do a good run on the local mountain road. Lots of grip... outright grip feels better than the Dunlop ZIIs currently on my NA. The feel reminds me a lot of the NT-01s I had on the NA previously. At the edge of adhesion, they give plenty of warning, and come back predictably when you back off. Our NC is set up to tend a little more towards understeer than I really like (because it's my wife's DD), but I can get the car to rotate off throttle, and it's easily managed with the V720s. Our local mountain 'circuit' is ~15 miles one way, mostly medium speed corners (40-60) with a few more open sections. Pushing hard, I can easily overheat an S.Drive (previous tires on the NC) in one, one-way run. ZIIs will start to fade a bit after a hard round trip in the NA. The V720s didn't bat an eye after a hard round trip with ambients in the 70s. On the street, they hum a bit at medium speeds (30-50), but are pretty quiet on the highway. We'll be on the track at FM Summer Camp on Thursday, so I'll post my impressions of actual track use later this week. Check out the tire rack test, they did pretty well. Keep in mind this is on a heavier car with limited camber http://www.tirerack.com/tires/tests/...y.jsp?ttid=202 The XS did stand up really well to heat. The V720 might be a good tire for crapbox endurance racing if it has the same heat tolerance, cheapest of the bunch too. Having read that, id really like to try these for my next set at $99 each for 205s. The big downer is there is no 225 for a 15. Waiting on longetivity reports. Don't the zii's last forever? Just got back from the track here in Grand Junction, and my first track time on these tires (and in the NC). Track is a .9 mile go-cart track, that's pretty tight. All 2nd gear in our NC, except the front and back straights, where I was briefly into 3rd. Fast guys in V8 and turbo cars were running 1:05-07s on R comps. My best time was 1:09.0, and consistent 1:09.5s. Our NC has Konis, Progress springs & sway bars, and a Goodwin muffler... otherwise stock. My impression of the V720s, is pretty much just a repeat of what I previously posted. Predictable, with lots of margin at the edge of grip. They seemed to suffer a bit in outright grip later in the day when it got hot (over 90*). Our NC doesn't have the beans to get them spinning on corner exits, but I could get it to rotate on trailing throttle. Overall, they work, and they're cheap. Probably not going to set FTD, but neither am I.
I'd probably buy a set for my NA, but my next set will be 225s, which, as noted, aren't available in the V720. If they last anything like the XS, ill be exited. Our XSs lasted 2.5 seasons with 2 drivers. Our rivals have 4 track days on them(about 2/3 of a season for us), and ill be lucky to get another 2 or 3, so maybe one whole season. They are stickier though. Doubt you'll get close to the longevity of older tires with the new generation of rubber. Fast guys in V8 and turbo cars were running 1:05-07s on R comps. My best time was 1:09.0, and consistent 1:09.5s. Our NC has Konis, Progress springs & sway bars, and a Goodwin muffler... otherwise stock. I saw a couple of cars on NT01s... not sure whose, though. Keith also posted this morning on M.net that he went 1:06 something in their ND with RE71s and a front alignment. I need to have one of the FM guys ride with me next year... I'm pretty sure there's a better line than I'm using through at least a couple corners. LOL. How were your Rivals holding up in the afternoon? Not sure who you are asking, but ill respond with my experience. They dont. Im in phoenix though so our mid morning is probably your afternoon. First session of the day is always between 8 and 8:30 and is always the fatsest. Im anywhere from a 0.4 to 1.2 ish seconds slower as the day goes on and the track heats up. The one thing I really liked about the XSs is their ability to withstand the heat. I can only remember them getting greasy once after 20 minutes straight of hotlapping, I was in a groove. Lap 14 or so, I had to back off and let them cool. Having said that a greasy rival is still a little faster tan the XS, by maybe a 0.5. Last edited by hi_im_sean; 07-31-2015 at 03:03 PM. Sorry, I was asking codrus, since he was here in GJ yesterday. Curious how the Rivals did on the same day. The V720s started to lose grip in the afternoon. Keith posted in the other thread that temps got to 95* yesterday. Not Phoenix hot, but still hot. And we're only doing 5 lap sessions, but it's more like a long, fast autoX. Since I'm usually tracking in Phoenix, your experience is also valuable. The Rivals fell off a lot. I only did 4 sessions -- was having cam sensor heat soak issues causing sync losses in the first 3, although I managed my best (1:07.3) in session 2. I got another sensor at lunch time and put it in, the 4th session felt really good, but was half a second slower according to the clock. Tires were overheating and sliding. After that I called it quits because *I* was overheating, and I needed to go pick up my truck. My Rivals are pretty old, I mostly use them as street tires (RRs for big tracks). And yeah, Keith probably has 10,000 runs on that track. So I was cruising tire rack to see when the RS-3 V2 would come back into stock and saw this. Unbelievable pricing and I had NO clue the V720 was coming in a 225/45/15.